How does Hotjar Incoming Feedback Work? Incoming Feedback provides you with both individual comments, issues, and a general overview of your visitors' experiences with your site. Both are available within the Insights interface. If multiple Incoming Feedback widgets are set up, these responses can be viewed by clicking the grey View Responses button. If only one Incoming Feedback widget is set up, this is the default view in the Insights interface. The toolbar at the top allows you to select between viewing individual responses or a graphical view of results over time. 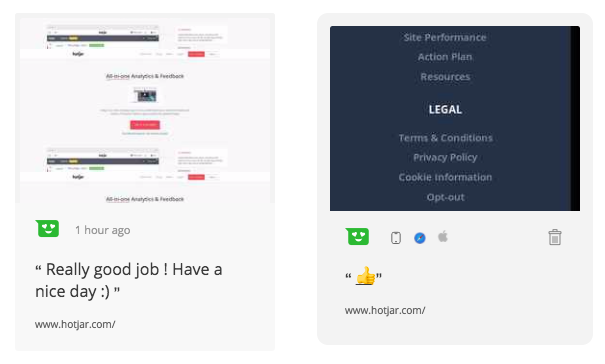 In the Responses view you will see a list of all received responses from your visitors, together with a screenshot, if provided, a rating and a message. If you hover over an individual response you'll also see the device, browser and operating system for that visitor. See each visitor's feedback in Insights with a rating, attached screenshots, and text. In the Response view, you can optionally filter responses to include only those received within a certain time frame (from the last 12 months to the last 7 days). You can also choose to view only responses that rated you a certain way. For example, you could choose to view all those visitors that Hated or Loved something about your site. 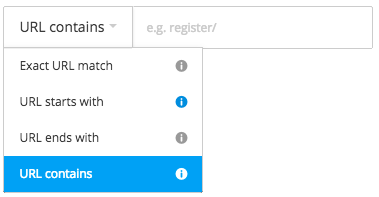 Finally, you can filter responses by URL with either an exact, starts-with, ends-with or contains match. More information on URL matching is available in our page targeting documentation. In combination with the previous rating filtering, this is a great way to find problems or positives with specific parts of your site. The results view gives you the big picture, allowing you to track user happiness over time. Ratings you've received are displayed as a timeline graph of average feedback rating. The total counts for each rating and percentage of each are also shown on the right-hand side. You can also find summary statistics of feedback over time. Just like for the Responses view, here you can also filter the responses to only include those that have occurred within a specific timeframe, or those whose URL matches a particular pattern. This can be useful to see the effects of changes you've made to your site on user satisfaction with specific pages or the whole experience. If you want to take a closer look at your Incoming Feedback responses, you can export them by following the instructions in our Exporting Responses article. Note with Incoming Feedback you can export up to 10000 responses in a single file. In each Incoming Feedback widget, you can choose to forward visitor's responses directly to an email address. This option is in Step 5: Forward feedback. All responses that have an email address will automatically be forwarded to this email address. These emails include the visitor's sentiment, and any comments or screenshots. Replies to this email will be sent directly to the visitor. Only one email address can be added to the Forward feedback step. Responses that do not have a visitor's email address will not be forwarded to your email address.